Today we have Mistie back from American Crochet. She designed for us a cute little drawstring bag that’s worked up in a crochet thread. And from my point of view, this crochet butterfly bag has summer written all over it due the thread and the pretty lace. 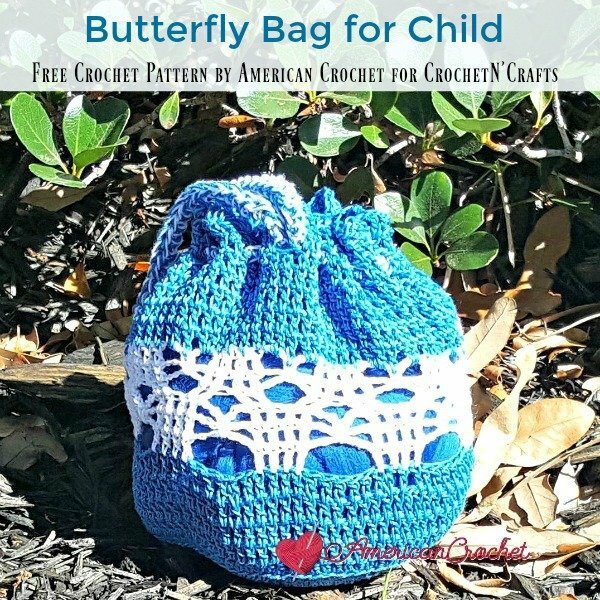 Pay no attention to the title of this pattern as this bag is not only perfect for children, but I would so use this one for myself any day! With the lovely butterfly lace stitch in the middle, you will be proud to show this one off whenever you need a cute little drawstring bag. The finished size is also a good size, making it great for holding your basic necessities. You might also like the blossom drawstring pouch, or this cherry blossom bag. 1. Start with bottom and work up. 2. Chain 1 at beginning of rows DOES NOT count as a stitch throughout unless otherwise stated. 3. Chain 3 at beginning of round COUNTS as first double crochet unless otherwise stated. 5. Round 12 is worked Back Loop Only, this round defines the bottom of bag. Round 18: Chain 3, dc in the next dc, chain 5, * dc in the next 4 dc (skip the chain 5 space below), chain 5, * repeat from * to * around, dc in the last 2 dc; join with a slip stitch in the top of the first chain 3. Round 19: Chain 3, dc in the next dc, chain 5, * dc in the next 4 dc, chain 5, * repeat from * to * around, dc in the last 2 dc; join with a slip stitch in the top of the first chain 3. Round 29: Chain 1, sc in the same stitch as join, skip the next stitch, work shell in the next stitch, skip the next stitch, * sc in the next stitch, skip the next stitch, work shell in the next stitch, skip the next stitch, * repeat from * to * around; join with a slip stitch in the top of the first sc. Chain 121, hdc in the second chain from hook and across. Fasten off and lace through Round 24 of bag, secure ends of tie together and weave in ends. And don’t forget to check out the other patterns by American Crochet.